Whew. 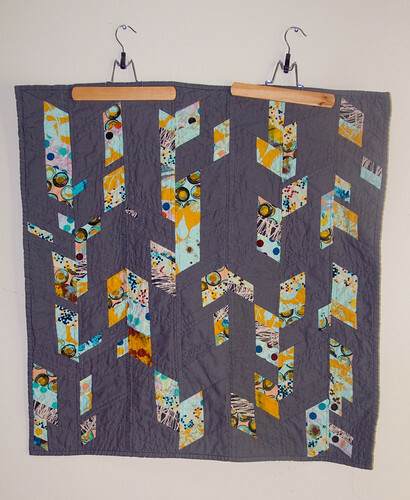 I got my habitat challenge quilt done! It seemed a little dicey for a while, but I finished just in time for our guild's reveal yesterday! This is probably the most inventive quilt I've done so far - I am still not sure if I like it even, but it is interesting to say the least. anyways, I cut what was left into 60 degree diamond shapes of differing sizes, and sewed them back together with some kona coal in a sort of expanded/free pieced/de-constructed chevron/friendship braid. Kinda cool, kinda weird at the same time. 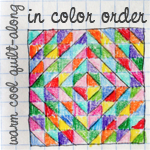 I quilted it to emphasize the chevron-ness, in some places, the chevron gets lost, especially in the grayer areas. I also learned something about thread during this quilt! I bought a different brand of thread for quilting this one, (Gutermann 100% cotton) and my machine does not like straight line quilting with it. At all. even with a walking foot. it was kind of weird. uneven stitches galore! But later, I put the Gutermann with a free motion quilt foot...and hoo boy. I found a perfect thread for FMQ! I'm so excited, FMQ has eluded me with my normal thread brand, and now I can really get going practicing!